As a second year university student, I know what it feels like to have stress come at me from left, right and center... It's so awful (especially when you feel like you have no-where to turn).The stress from university compared to sixth form is kind of different to me because I actually felt like sixth form stressed me out a lot more than university did. I am literally prone to getting stressed a lot, so I always try to think of different ways to avoid it and here is what I found that works for me! (Also just as a side note, these may not work for everyone but this is purely what I find which helps me. It may help you or it may not but hopefully it does). Personal tutors are assigned to you when you start university for purely this reason. If you're stressed about upcoming assignments, presentations, exams or even just who you live with, they're there to talk to and give you guidance on what to do. With the amount of money you're paying to be in university, their help is essentially what you pay for (as well as your degree, obviously). I don't know if this is the same for other universities but in mie you get 4 meetings every academic year with your personal tutor but you can request more just by emailing them or just finding out their open office hours (meaning you can drop by whenever in that time to talk to them). Seriously, this is a big one. Don't bring any exam, assignment or essay stress into your living environment. I know it's tempting to stay in your bedroom, living room, kitchen or wherever to do work rather than going somewhere public to do it - but seriously this is a very helpful hint. The reason you really shouldn't do this is because if you're getting stressed about something in a specific location, your mind and body will associate that particular place with stress and whenever you go back there, you'll become stressed then not want to go there. It's better to do work for assignments, exams, presentations or essays in a place like an on-campus library, you're surrounded by other people doing work so it'll influence you to do work as well as providing you with a pretty decent environment to do work and to not be distracted, which is another thing. Working at home for university is always a bit of touch and go because it's full of distractions, but at the same time it's also a good thing because if you need a break then you can just stop whatever you're doing and just chill out for a little while. Basically, all in all, it's a balance for you pretty much. This is pretty vital in all honesty. NEVER overwork yourself, no matter how much you think you work better under pressure (like I think I do, but it's been proven that I do). Regular breaks are essential because it halts the stress before it gets too much for you and your body to handle. With having regular breaks, it doesn't really mean stop for hours then resume later (although you can if you want!). It usually means do work for half an hour, break for 10 minutes and use that as a cycle pretty much. You can do anything in these breaks, like go for a walk, play a game, listen to music, chat to some friends/family, browse the Internet for a little while, check up on social media, cuddle with a pet... The list is pretty much endless. For me, personally, I leave the room I'm working in (if I'm at home) and I go sit somewhere else with my phone and relax for a few moments. 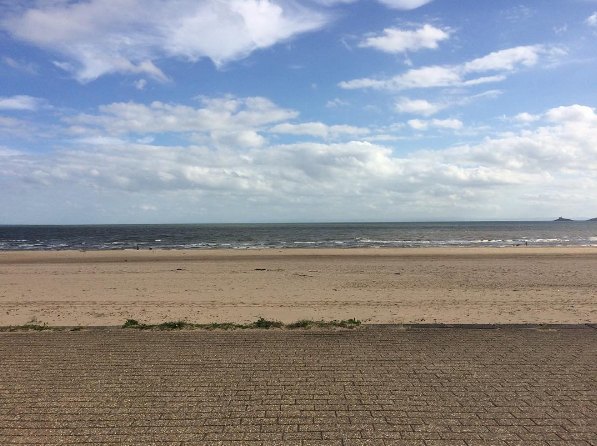 If I'm feeling particularly stressed, I'll go out for a walk since I live near a beach so I go across the front and put my headphones in. Personally, I like this idea a lot because I like taking myself away from work just for a few moments so I don't end up being a total stress ball because I get very irritable and emotional. There's nothing wrong with admitting that something's wrong. If you seek help from your wellbeing/counselling service, it's worthwhile even if you feel like you're there for a minor issue. The services there provided for you are so much help and never be afraid with requesting to see one of them if you feel like your stress is becoming a real big issue (as in your sleep is affected and so is your mood). If you don't have a regularly available service from your university regarding wellbeing, Mind.org have a few pages on their website for stress which I'll link here. They are amazing for mental health and have helped me when I've felt anxious or depressed and I love the guidance they've given for people who are potentially suffering and can't access services they need. This is similar to tip 1, but your lecturers will help you with any essay or exam issues you're having. They'll provide you with some help for preparation but unfortunately they can't give you all the answers. They can help as much as they can, but obviously there are limits to the help they can give. They don't want to see you struggle and the last thing they want for you is to fail, so they'll happily offer you any help you need, whether it be related to work or mental health. They're there to help and would prefer their students to be happy with their lives and their work, rather than dreading doing assignments or feeling under the weather. For me, nothing beats the university stressors than going for a walk and doing productive things. 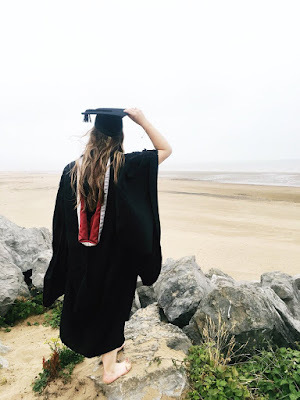 Where I am for university, I live near a beach as well as in walking distance to the local town centre so it's ideal for me since I love walking. Other things I like doing are reading, going out and taking photos for my blog headers/Instagram. It's nice to stay in sometimes, but going out is also good because it lets you de-stress, wind down and to just really appreciate things more (in my opinion). If you're in university which you live away at and don't commute, I feel like it's nice to really take it in where you are because you're not there forever (unless you decide to live there after you graduate). Taking pictures of where I am currently make me happy because it really lets me think about where I live temporarily and I really like being where I am. Sometimes the stress brings me down but it'll never make me want to leave where I study. What are some things you do that help you deal with stress? 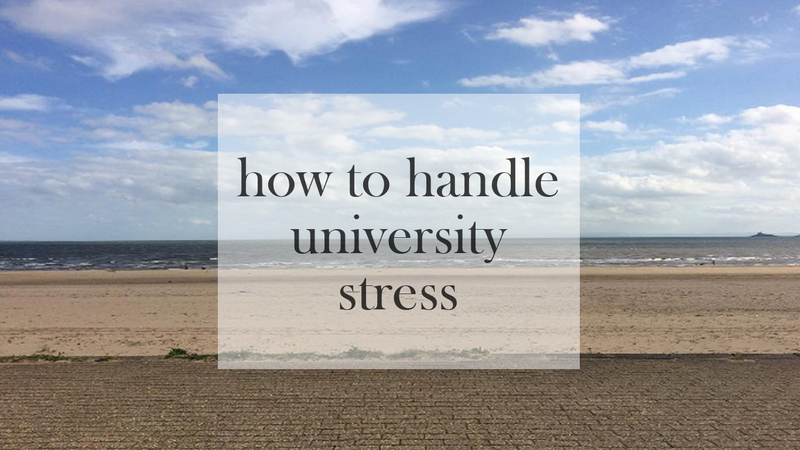 I hope my handling stress tips helped and that you live a stress-free university life because you deserve it.